A growing profile of 381 food businesses in Shrewsbury and Shropshire including 1186 independent food reviews. 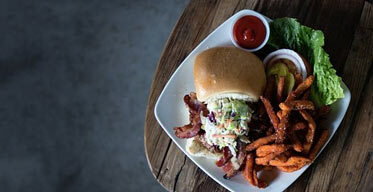 A great way to find places to eat is to view our interactive map filled with delicious treats to make you feel hungry. We start you off looking at the centre of Shrewsbury, but zoom out from street level to view the whole county and pick up some great farm shops, pubs and restaurants along the way. While we do not have the diversity of a city like Birmingham, we do still have a great choice of food right here in Shropshire, and the types of food available to us get more interesting by the year. We now have more than twenty categories of food; from the traditional British restaurant, to Spanish tapas. Biggies Diner is now up and running in Frankwell, and Harvey's of Fish Street is coming soon, while London Chicken and Brooklyn Craft are new to Castle Foregate and Castle Gates respectively. Know of anywhere else? Give us a shout on facebook or twitter or use this quick form to suggest a business. This is a great cafe with friendly staff. All the food is freshly cooked. The breakfast was lovely and very reasonable priced. Called in with my wife when passing last Thurs. (13/9/18) and had a wonderful lunch. The staff were welcoming and efficient and we had some of the best food we had had for ages. Brewing experienced something of a revival in popularity during the last five years as the number of craft or microbreweries grew substantially. 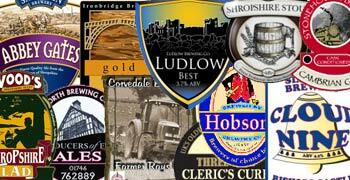 In Shropshire we currently have seventeen breweries mixing grain, hops, yeast and water to produce award winning ales. A lot of people seem to have the misconception that vegetable box schemes are expensive. If you are used to paying supermarket prices, you will be pleasantly surprised. 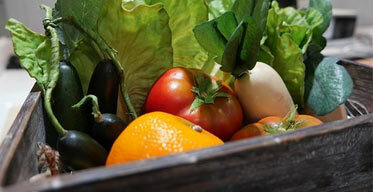 Here is a round up of the best fruit, vegetable, meat and fish box schemes the county has to offer. 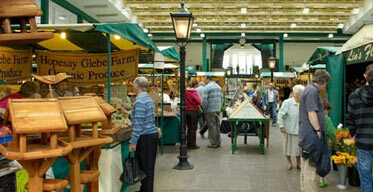 The Market Hall at Shrewsbury is a fantastic place to buy your fresh fruit, vegetables and meat from local producers. The market stall holders are a friendly and knowledgeable bunch and between them offer some of the best locally produced Shropshire food. Opens most days of the week. 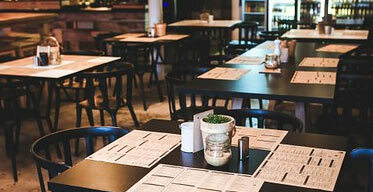 If you are some way from home, or local and just looking to make a night of it, there are some great places to eat before or after a night at the theatre. 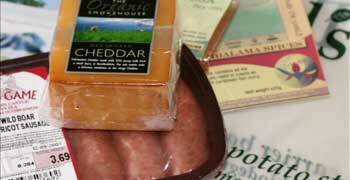 On the following page we highlight our top picks, with something for every appetite and pocket. Shropshire has a large rural economy so it stands to reason there will be plenty of interest in food festivals. We certainly have our fair share of great events. From the well established Ludlow food festival to the newstart Shrewsbury food festival, late summer equals fantastic local food. Whether you want the traditional cod and chips, a slightly more adventurous grilled plaice, or any other combination of battered sausages, pies, fish cakes, and onion rings, your local chippy won't be far away. 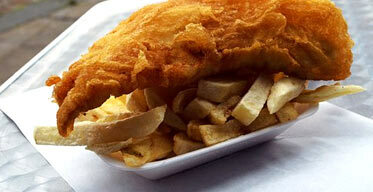 Find out more about Shrewsbury's fish and chip restaurants on the following page. eatshrewsbury.co.uk is a food map of Shrewsbury and surrounding area. We pride ourselves in our accuracy - other websites create maps using post code data to display the locations of businesses, often leading to their maps being completely inaccurate - where possible we plot the actual location. However, we cannot be held responsible for any inaccuracies due to business closure or relocation. We reserve the right not to publish the locations of every food business in Shrewsbury and surrounding area, though we will make every effort to do so. 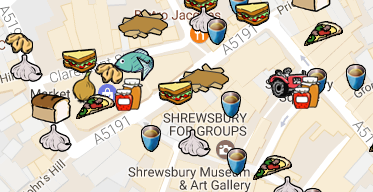 This is a food map of Shrewsbury. 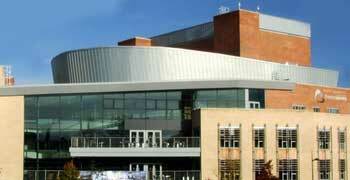 Therefore the highest concentration of businesses displayed is in the town centre. We are displaying some businesses such as farm shops, butchers and breweries which are further away from the town centre because we feel that people will be more inclined to travel further out to these places. We are not currently showing places such as take-aways and restaurants in nearby towns like Church Stretton or Wem or Much Wenlock. The classification of businesses is subjective. Often the difference between a cafe and a restaurant, between a restaurant and a pub, between a bakery and a sandwich shop is blurred. We reserve the right to classify businesses as we see fit. The logos used on the map to illustrate the different business types may not always be accurate. For example, we have used a pot of jam to symbolise "delis and specialist food shops". This logo is fairly accurate for Appleyards who do sell a variety of jams, though for Setonaikai it is less idea as they specialise in Asian food. Never the less, the logos have been chosen for convenience. We also reserve the right to remove any businesses from the map at any time. Comments and opinions on this site represent the considered viewpoint of eatshrewsbury.co.uk, based on our research into, and understanding of, the food industry. It should be stressed that as inputs to our reviews, we may rely on a variety of external primary and secondary sources of information, which, despite our efforts to validate, may occasionally be inaccurate. Our own opinions are provided in good faith. All reviews are from members of the public and may not match your own experiences. We are providing this information as a guide of reference. Opinions expressed in these reviews are not the opinions of eatShrewsbury. Similarly we do not accept responsibility for the content on 3rd party sites which we may provide links to.